Parasomnia Music is proud to present the debut release of Marc Maniac (AKA Gollu) from Jutland in north Denmark. 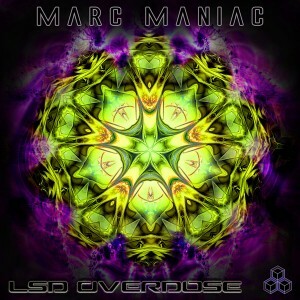 LSD Overdose contains four driving, night-time progressive psytrance tracks ranging from 135 to 138 BPM. Marc’s music creates deep atmospheric vibes and is loaded with lysergic synth-lines and squelchy FX sounds. Enjoy the ride! Mastered by Logic Spin @ PSR Music, Germany, with artwork by Patara. MP3 Download | FLAC Download | WAV Download · Download count: 9,048. There is something wrong with The forbidden moves track??? starts like half way through the track…? Beautiful work! I love how each of the sounds are so holistic. Thoroughly enjoyed listening :). i think everything is fine with the track. all tracks running here all way thru. maybe loose connection or something like that! Deep, Crunchy and Awesome Release, a Rocket Launch Maniac Debut!!! True Parasomnia Pearl!!! Would love to hear you here in Cape Town. Thoroughly like your tunes! WHich program do you use? what do you think EskimoED ? !